Just reminiscing about those slot reds from the fall. Many days were like this! travis, Prospector46, pokenfish and 3 others like this. eym_sirius and Prospector46 like this. Yep, what a run. I sure do miss it right now.... they were as dependable as clockwork for 6 weeks or so-it was a nice problem trying to decide if you'd fish for kings, spanish, bull reds, jacks or slot reds. Flounder and trout as well. Lots to look forward to with whiting and sheephead to occupy us in the mean time. ironman172, 9iron, travis and 4 others like this. I won't keep "bull" reds, but slots and just over the slot up to about 30 inches (the largest I've kept) are excellent, either fried or on the grill. I way-prefer slot reds to Spanish - but I do like fried Spanish, too! Prospector46, 9iron, oldfisherman and 1 others like this. 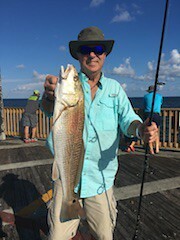 My first Redfish in September. My wife ordered Redfish at Mike's Seafood when we were down in October. It was excellent. Hadn't heard to many good things about it before that. We ate the one in the picture a few weeks ago. Also excellent. Got to try the throats next time. Hope tp see you all this Spring. It's 18 degrees in Prospect, KY! benhunts, chillinfish, ironman172 and 1 others like this. Got to try the throats next time. Hope tp see you all this Spring. It's 18 degrees in Prospect, KY! eym_sirius, Prospector46, chillinfish and 1 others like this. Oh yes, I remember those slot days. A small hardtail on a hook with a bit of weight to get it down to them resulted in a mega hook up in seconds. Light tackle was incredibly fun. Having to run down the pier to borrow a net was not as fun. tigershark and eym_sirius like this.